Barcelona face Inter in the Champions League on Tuesday night, but Lionel Messi will play no part against the Italian giants. 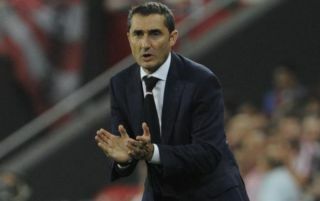 It had been reported by Mundo Deportivo that the Argentine superstar could be named on the bench, but coach Ernesto Valverde is seemingly taking no chances with him as he continues his recovery from a fractured arm. In turn, it remains to be seen if he returns to action at the weekend when Barcelona face Real Betis on Sunday, but Messi will sit out in midweek to continue to recover. The Catalan giants will hope that they don’t miss his presence as they look to solidify their place at the top of Group B, with a win securing their place in the knockout stage of the competition. Given that they’ve won all four games without Messi during his absence, scoring 11 goals in that run, Valverde will be confident with the options at his disposal. However, as seen in the tweets below, many fans were particularly pleased with seeing Ousmane Dembele get a chance in the starting line-up, as he’ll look to play a key role in the final third alongside Luis Suarez and Philippe Coutinho. The 21-year-old has bagged six goals and two assists in 14 appearances so far this season, and he’ll hope to add to those tallies and make a positive impact to help Barcelona get the job done in Europe. Further, he’ll hope to ensure that the decision to leave Messi out, albeit a likely enforced one, won’t come back to trouble them in Italy. Finally dembele has his chance ?? Great squad. Glad to see Dembele in the starting lineup.